We pitted the teams against one another in terms of total number of people interested in each team across the United States on Facebook. Not surprisingly, the majority of each team’s fan base is located near the university’s home state. 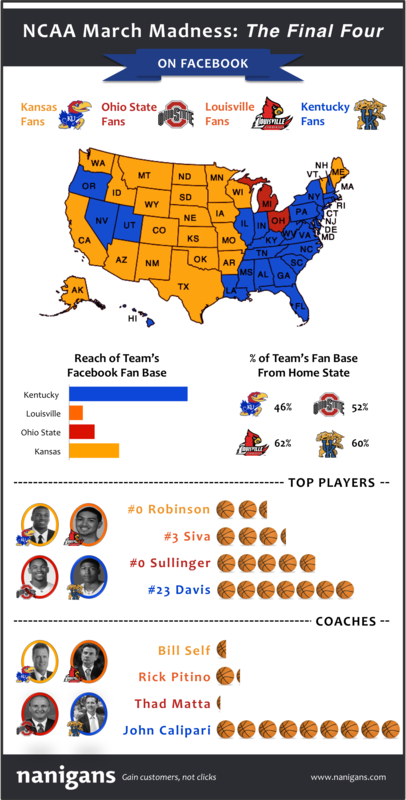 When comparing the reach outside their respective regions, interestingly, Kansas has nearly as many states rooting for them as Kentucky even though Kentucky far outpaces Kansas in total Facebook reach. Louisville, on the other hand, suffers from being from the same state as the highly popular Kentucky team, and do not have a larger reach in any state. It appears that Coach Calipari’s controversial tactics of pursuing key players despite their likelihood of turning pro after one year seems to be working. Kentucky far outpaces the competition in every field, and the buzz around the coach, positive and negative, makes him one of the most polarizing figures in college basketball. Whether you love or hate Coach Calipari and his team, interest on Facebook shows that he and the Anthony Davis led Kentucky Wildcats are a must-watch on TV. Overall, if Facebook buzz determined the winners this weekend, Kentucky and Kansas will be playing each other in the 2012 NCAA basketball championship.